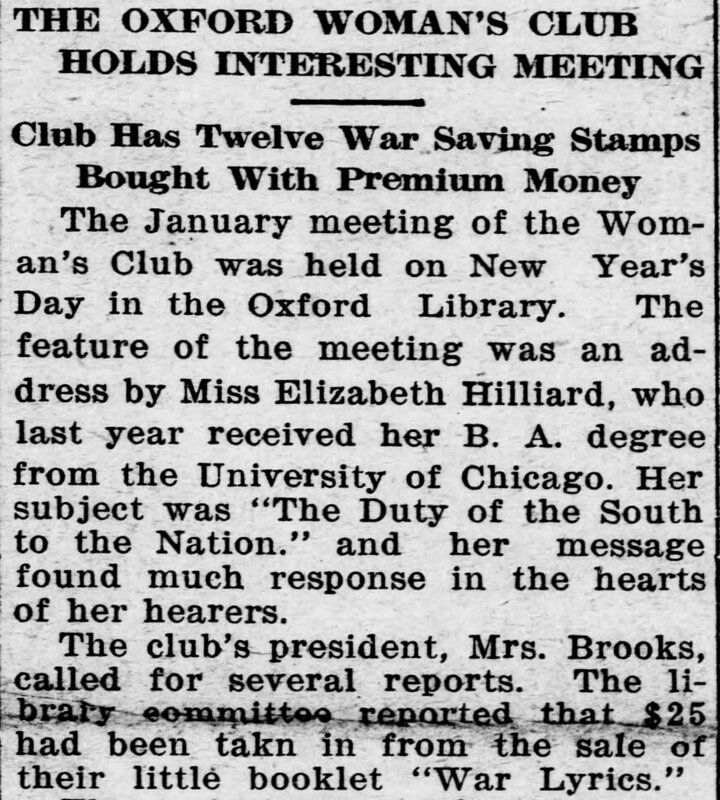 Throughout World War I in North Carolina, women’s groups in each county supported the war effort by producing items that were given away to purchasers of war savings stamps, producing events to support troops serving in military camps and overseas, and developing programs aimed at raising morale on the home front. 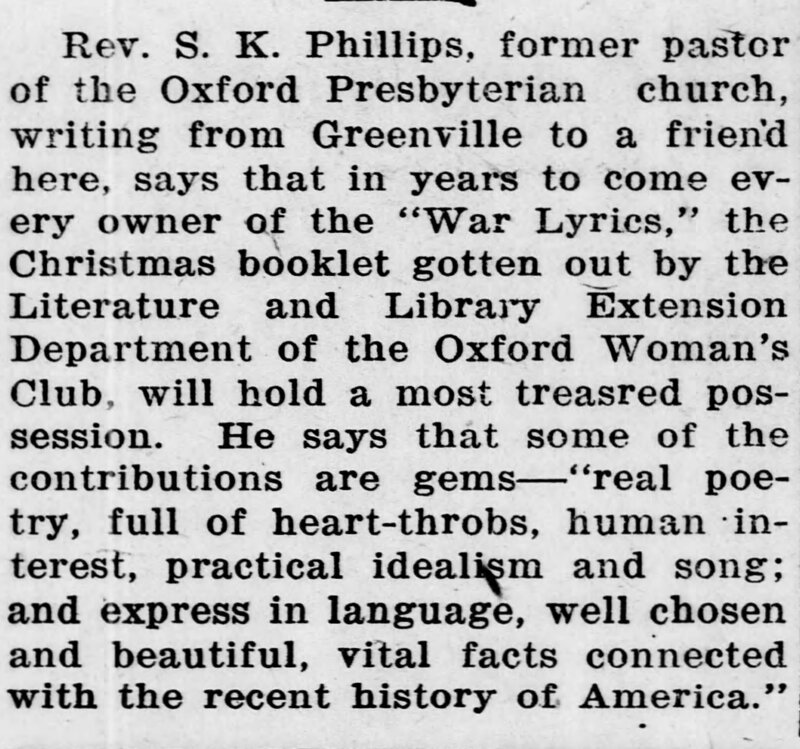 The Oxford Woman’s Club of Granville County produced a booklet of war-themed poems for sale in December 1918 to support their public home front programs during WWI. The booklet, entitled War Lyrics, was sold around the state, and appears to have become one of the more widely-distributed home front war poetry or song booklets in North Carolina during WWI. It was created by the club's "Literature and Library Extension Department." The booklet’s poems expressed the feelings of North Carolina women facing the effects of war as their husbands, sons, and friends were in military service. The lyrics depict their struggles to not only survive the war and provide for their families, but also their desire for recognition of their efforts in comparison to those of servicemen fighting overseas. All of the poetry was written apparently by the membership of the Oxford Woman's Club. The following poem "A Service Flag"—transcribed from War Lyrics—was written by Ellen Hurt Moorefield Brooks of Oxford, N.C. It compares the public display of women’s war work, with the rectangular cardboard or fabric window service stars placed in windows of homes to denote a household with an active serviceman. The poem concludes that a woman’s sacrifices and labor at home are just as important as a man fighting on the front lines—a revolutionary concept in the male-dominated culture of 1910s North Carolina. It is one of the clearest expressions of how women in Granville County, N.C., undoubtedly felt as they saw their sons, brothers, and husbands leaving them behind for a distant war amidst rationing, the Spanish influenza pandemic, and financial struggles at home. But quite a diff’rent stunt. The field of tan—my face. One of the only known original copies of War Lyrics was donated to the North Carolina Historical Commission by 1920, and is available for use by the public in the North Carolina County War Records (WWI 2) of the WWI Papers at the State Archives of North Carolina in Raleigh, N.C.